Complete a HOTLIPS Pizza Week Passport and be rewarded with a free 10” (2 topping) pizza. Passports are available at our counters. $2 slices are limited to 2 per customer. Supernatural combination of pesto, mushrooms, and goat cheese blasting your taste buds into another dimension. House-made basil pesto, sautéed mushrooms and mozzarella featuring goat cheese from Portland Creamery. House-made squash sauce, mushrooms, roasted red peppers and mozzarella featuring goat cheese from Portland Creamery. Sun dried tomatoes and communism: widely shunned in the 80s, experiencing a slow-burn renaissance. Try it out with some winter veggies, a staple (we presume) of communist diets. 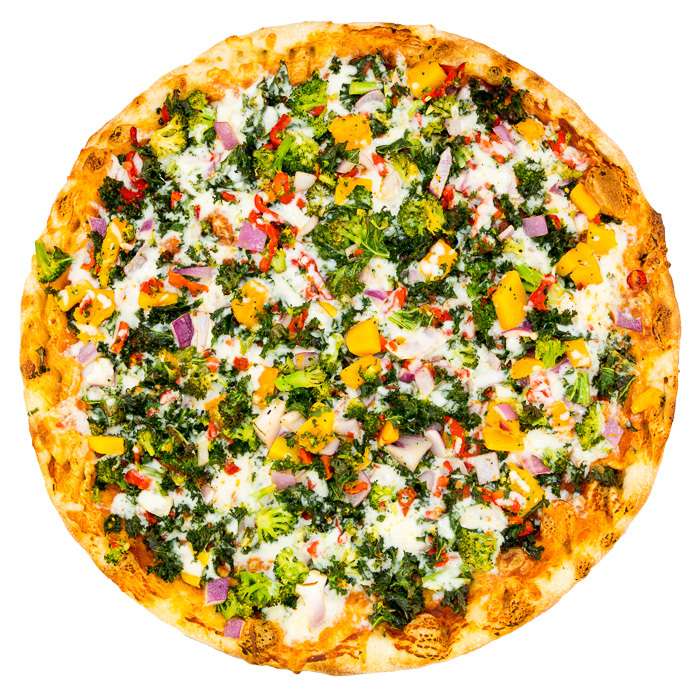 House-made sun-dried tomato pesto and mozzarella with diced onion, kale, roasted red peppers, broccoli and squash. Hatch chiles and vegan sausage are guaranteed to get this slice back on the charts. Vegan sausage, hatch peppers with real mozzarella OR Follow Your Heart Vegan Cheese on rich, house-made marinara sauce. Better late than never, the Beyond Burger rookie and his teammates Tomato and Cheddar are taking this slice all the way to the top. Beyond Burger, Tillamook cheddar cheese, sliced tomato and mozzarella on rich, house-made marinara sauce. A trinity of mushrooms, onions, and garlic so delicious it doubles as a suitable sacrifice for the pizza gods. Caramelized onions, sautéed mushrooms and mozzarella on house-made garlic parmesan sauce.